This recipe is adapted from the Down to Earth Cookbook by Sher & Doherty. Down to Earth was the name of a vegan organic restaurant that is no longer open. The current incarnation of the original restaurant is the Good Karma Cafe in Red Bank, New Jersey. They have delicious food and I always loved their Jam Dot cookies. I converted the recipe to gluten free and also changed the type of nuts. They came out really well. Light, ‘buttery’, soft and flavorful everyone who tastes them for the first time comments on how surprisingly different and delicious they are. Preheat the oven to 350°. 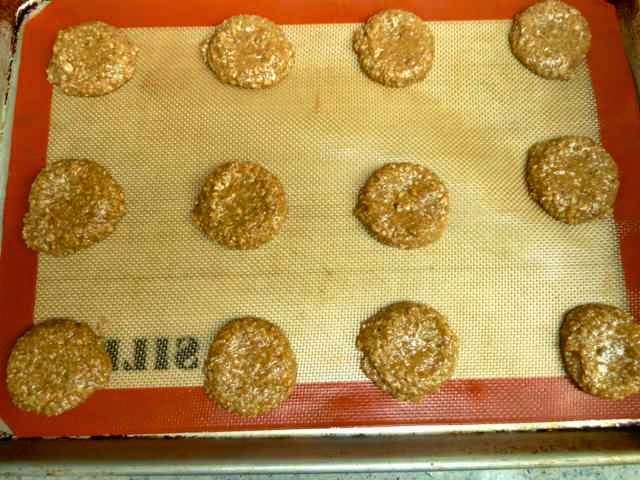 Prepare baking sheets by lining them with parchment paper or silpat pads. Pulse the nuts in a food processor to a medium ground. Add to a large bowl. Pulse the oats until finely ground and then add to the bowl. Next add all the flours, xanthan gum, sea salt and cinnamon. Mix well. Add the oil and maple syrup to the flour mixture and mix until well combined. Dough after all mixing is done. Portion out the dough with a scoop that measures 1½-inches across or 1 Tbs. of dough. Flatten slightly with wet palms. Press down the center of each cookie with the back of the scoop or with wet thumbs. A deeper hole will keep the jam from leaking out during baking. and then dented in the center with the back of the scoop. 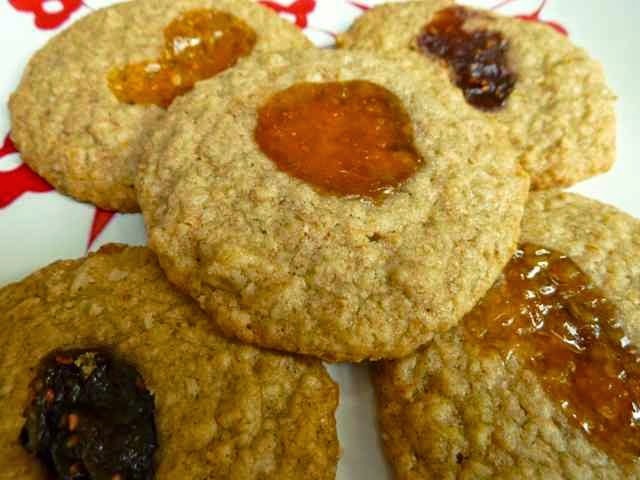 Raw cookies with jam in the centers. Some have apricot and some have raspberry jam. The raspberry jam on the cookie in the top left had a heart shape when done. It was eaten before I could get a pic. Placing jam in the shape of hearts for valentines day would be a good idea. Bake 15-18 minutes until the cookies are golden brown. 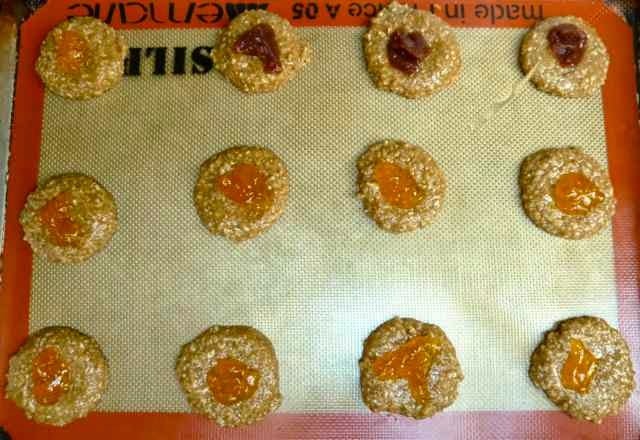 Cool on the baking sheets before transferring cookies for serving or storage. Hot cookies will fall apart when moved. The cookies will keep well at room temperature for about 4 days. Wrap and freeze cookies for longer storage. 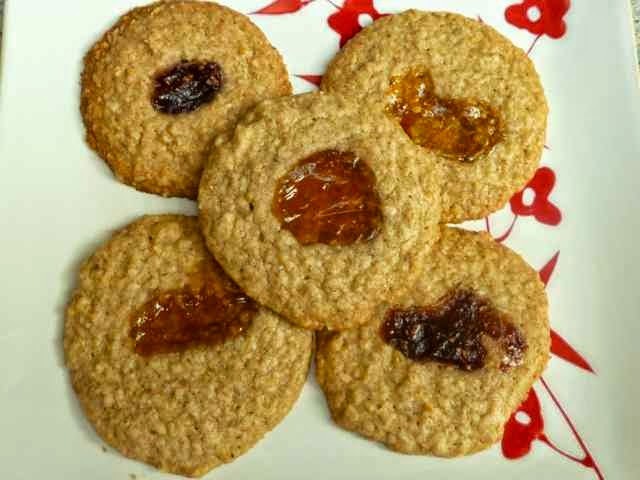 GLUTEN FREE VEGAN NUT AND JAM COOKIES Makes about 50 cookies (Using a 1½” scoop or Tbs. to portion out the dough.) 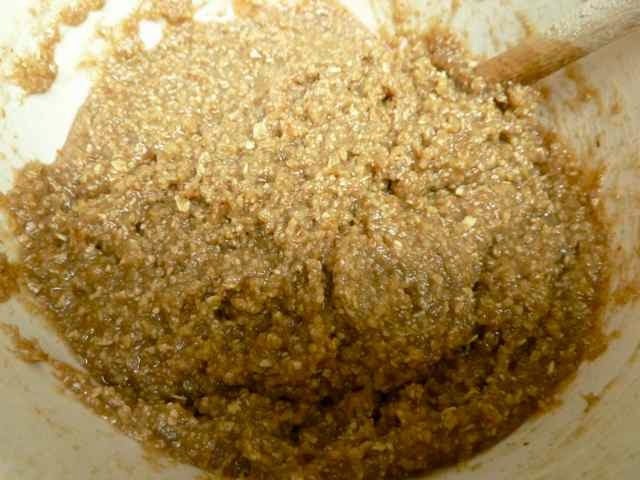 Ingredients 2½ cups Walnuts - raw 2½ cups GF Oats - Old Fashioned not quick 1¼ cups Sorghum Flour ½ cup + 2 Tbs. Chickpea Flour ½ cup + 2 Tbs. Tapioca Flour 3/4 tsp. Xanthan Gum 1/8 tsp. Sea Salt 1½ tsp. Cinnamon 1¼ cups Maple Syrup 1¼ cups Canola Oil 1/2 cup (approx.) Raspberry or Apricot Jam Directions Preheat the oven to 350°. Prepare baking sheets by lining them with parchment paper or silpat pads. Pulse the nuts in a food processor to a medium ground. Add to a large bowl. Pulse the oats until finely ground and then add to the bowl. Next add all the flours, xanthan gum, sea salt and cinnamon. Mix well. Add the oil and maple syrup to the flour mixture and mix until well combined. Portion out the dough with a scoop that measures 1½-inches across or 1 Tbs. of dough. Flatten slightly with wet palms. Press down the center of each cookie with the back of the scoop or with wet thumbs. A deeper hole will keep the jam from leaking out during baking. Add some jam to each hole. (About ½ tsp.) Bake 15-18 minutes until the cookies are golden brown. Cool on the baking sheets before transferring cookies for serving or storage. Hot cookies will fall apart when moved. The cookies will keep well at room temperature for about 4 days. Wrap and freeze cookies for longer storage.